Watermelons are a bit tricky to grow. When everything is right, they are really easy. But if your climate isn't right and you don't grow the right watermelon, it is frustrating. Watermelons originated in Southern Africa and grows best in tropical to sub-tropical climates. That means they really love heat and humidity. If you live in a place that is hot and humid and rains a lot, then watermelons are trivial to grow. Just plant the seeds and watch the melon plants grow and the beautiful watermelons to form. If you don't have those growing conditions, then you need to make some adjustments. First, there are several watermelon varieties that were developed for cooler climates. They are usually smaller melons, which don't require as long of a growing season to reach maturity. If you live in the north and have a cooler climate, then choose Golden Midget, Sugar Baby or Cream of Saskatchewan. Second, if you don't live in a place with a lot of rain, then you'll need to water your melons. Keeping them well watered is necessary for them to thrive. If you live in a cooler climate, it can be best to start your watermelons indoors. They don't like to be transplanted, so use a larger pot (I use red plastic solo cups), to start them. Only start them 2 weeks before you plant them outdoors. If they get too big in their pot, then they'll die when you disturb their roots. But those 2 weeks help you get a jump on the shorter season. 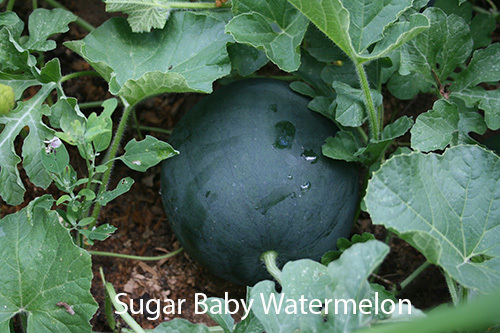 Growing watermelons is pretty easy after you choose the right variety and keep them well watered. Picking watermelons isn't so easy. There really isn't a sure way to determine if they are ripe and sweet. 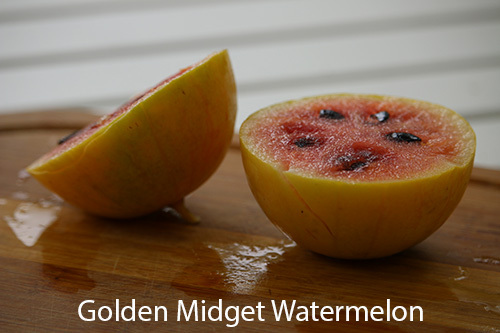 Sugar Baby Watermelons turn colors, and Golden Midget turns a nice yellow all over as it ripens. But even then, it is easy to pick them too early. This is a list of things to look for when you pick your watermelon. Belly where melon rests on the ground will turn to a creamy yellow. 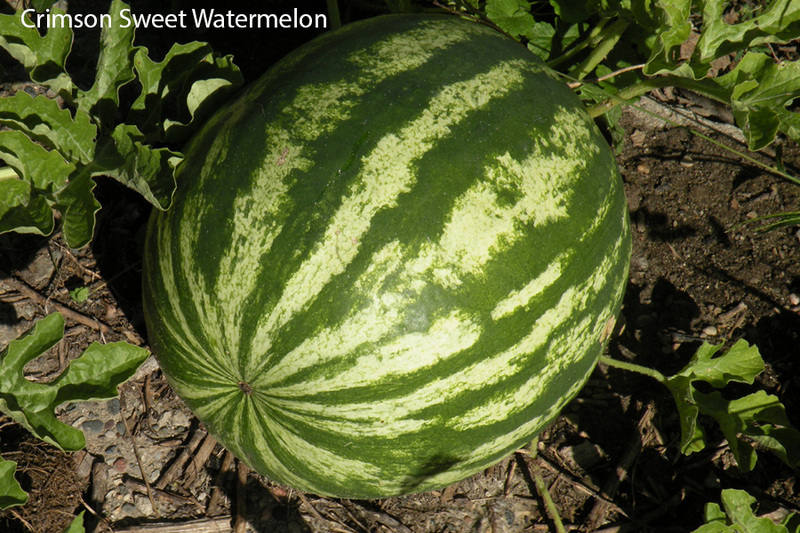 Wet cool weather can affect your watermelon ripening. The water in the melon needs to reduce so the sugars can concentrate. Too much water will prevent the sugars from concentrating. Sometimes the vines will appear to die back and wilt before the melons are ripe. There's nothing better than a sweet watermelon in the heat of the summer. When we get that perfect melon, it makes all the work and guesswork worth it.